I walk up to the cemetery sometimes and just stand in front of that angel. I think about people that I have known and lost over the years. I think about the many people I have buried in my own priestly ministry -- their stories, their struggles, their families, their faith. I think about the senseless killings that pervade our world through mass murder and war and acts of terror. I think about the presence of evil in our world and about the demons that drive people to desperation. And I think about the God of all hope who weeps when we weep and rejoices when we rejoice and is present to all who call upon his name. It’s true that human tragedy strips away the non-essentials of life and brings us right back to the things that matter most -- love, faith, compassion, and companions along the journey with whom we share these things. It’s also a reminder, in these days leading up to Christmas, that this season isn’t just about a cute yet helpless baby cooing in a stable but about our very salvation. It reminds us that Christmas isn’t just about the trimmings and trappings but about the miracle of God entering the world in human form; a world that can feel so full of darkness. Thanks, Father Tim. The Today Show obviously should have had you in place of that Joel guy. 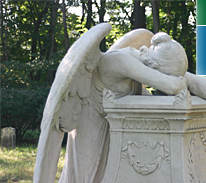 Thank you for sharing your reflections on the weeping angel. The picture you posted of her the other day touched me deeply as it did many others who viewed it. I appreciate you sharing your personal connection to her. Thanks Tim - In the midst of all this madness it's comforting to be reminded that God is ALWAYS with us. Thanks for your reflection and your picture of that very striking grave stone. I don't remember whose it is, but it is compelling and beautiful. Very Beautiful and inspiring, you put everything in perspective for me. I love the line "Faith in the God whose peace surpasses all human understanding doesn’t ease the immediacy of grief." Fr. Tim, what a beautiful way to remind us of Immanu - el. Having read your vivid description of the posture of the angel, is there another view depicting the body language? What a striking marker!